Can I use this 12v switch with a 24v load if the watts are the same? If not why? No, you can’t, you need to respect both the maximum voltage (when the switch in open) and the maximum current (when the switch is closed). If you open the switch with a voltage that exceeds the rated voltage, you may have an electric breakdown that will allow the current to continue flowing. On the opposite, if you exceed the rated current when the switch is closed, the switch may fuse. There’s nothing like rated power for a switch since an ideal switch always has either zero voltage or zero current. In both cases, the power is null. I will PARTIALLY disagree with user2233709. But, only partially. Also see both the useful link from Edgar and the useful links from those posts. 2233709 is "officially" correct - a switch is USUALLY marked both with ratings AND with certifying bodies who specify the applicable conditions for the test. In some cases manufacturers specify switch ratings without reference to a formal test specification. 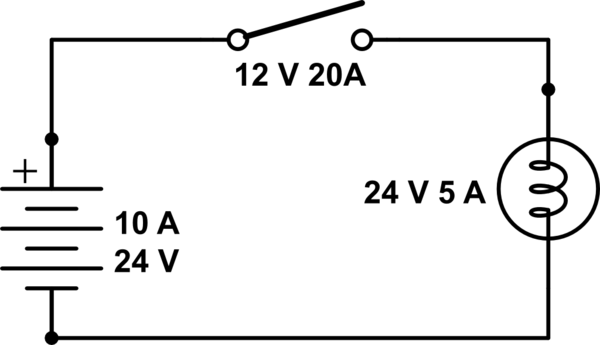 Switch current ratings generally relate to the power dissipation in the switch when the contacts are closed so in a given switch a 10A current will typically generate a quarter of the power of a 20A current, as power is equal to current squared x resistance. Switch Voltage ratings are generally mainly related to the ability to break an arc which occurs as switch is opened. The difficulty in breaking an arc is much greater for DC than for AC. Accordingly halving the current makes the load on the switch very much lower whereas doubling the voltage increases the design difficulty in closer to a linear manner at very low voltages. In all cases, but especially for uncertified switches where the basis for the ratings are not well defined, it is likely,but not certain, that a 20 amp DC rated switch will handle 10 Amps at 20 volts “safely”. However, if it doesn't you have no come back and in situations like an aircraft supply I wouldn't consider doing so. As a useful but not certain 'rule', switches from reputable manufacturers tend to have certified ratings which are traceable to a standards authority and switches without certification are liable to be from manufacturers who are less reputable. This does not mean that a switch without certification marks is necessarily incorrectly marked but it does suggest extra caution is required. Similarly a switch with many certification marks but which is from a manufacturer of unknown reputation makes it more possible that the certifications are not valid. The above mealy mouthed / weasel worded pontifications are a long way of saying that “Switches with fake markings from unknown sources are not at all uncommon in the industry - “Caveat Emptor” "
were sourced from known good supply chains. The importance of the last point is worth noting. If you buy eg a Sprague switch from Digikey it is probably a Sprague switch and probably it's specs can be relied on. If you buy a "Sprague" switch from Seller1234567 on ebay it MAY or may not be a Sprague switch and its specs may or may not be able to be relied on. The two ratings (voltage and current) for a switch are largely independant. It makes no sense to multiply them together and treat this as a parameter of the switch. For a switch, you must comply with both of the ratings at once, you can't really say that because the current is low, the voltage rating can be exceeded. It is true that as the switch opens and starts to draw an arc, if that arc is a very low current then it is more likely to be extinguished as the switch contacts start to open, but this really would only be a safe assumption with a current of 10s of mA (and even then, you're working outside of the specification). Failure will also not always be immediately obvious - the problem might be slow degredation which leads to a failure (or fire) after many switch operations. Not the answer you're looking for? Browse other questions tagged power switches dc or ask your own question. Is a switches voltage and current rating a hard limit? How can I switch a high current with a low-rated switch? Can I use a 10A light switch with an appliance with a 13A fuse? Is an SPDT switch spark-free?